Kerala is famous for its jack fruit(jack fruit jam Recipe / Chakka varattiyathu Recipe) , coconut, jaggery , Banana dishes and snacks. all of them jackfruit is only a seasonal fruit .here everyone loves jackfruite . Keralite Household make variety of chakka / jack fruit dishes .Jack fruit chips, jack fruit halwa, jack fruit kheer and many other curries. In kerala Jackfruit Season come to end but always tend to eat jacfruit recipes all over the year. This preserve can be used through out the year to make various Traditional C sweets. like Chakka Ada , Kumbiappam , Chakkappam, kozhikotta etc..
यहोवा परमेश्वर मेरी ज्योति और मेरा उद्धार है; मैं किस से डरूं? यहोवा मेरे जीवन का दृढ़ गढ़ ठहरा है, मैं किस का भय खाऊं? Apply some oil on your palm and Cut a Jackfruit. Remove seed from jack fruit. Cool & grind a paste. Keep in airtight container in Frezzer. 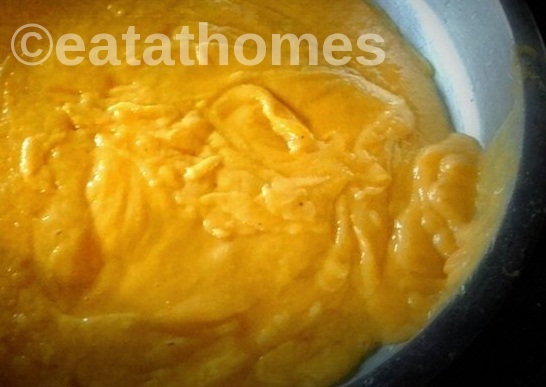 add ghee and sauteed above jacfruit – jaggery puree.